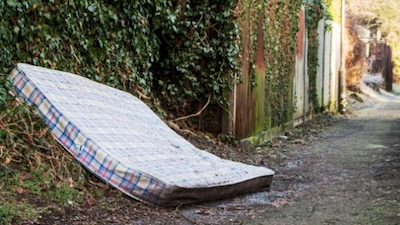 SACRAMENTO–The Mattress Recycling Council’s (MRC) Bye Bye Mattress Program (Program) said today a campaign to proactively combat the illegal dumping of mattresses and box springs. MRC’s public service announcement promotes the use of free, responsible disposal options in California. Meanwhile, ByeByeMattress.com assists consumers with finding free mattress recycling locations and events and offers tips for preventing and combating illegal dumping in their communities. Bring it to Bye Bye Mattress. Any mattress – no matter when it was purchased – can be recycled through the Program. There are hundreds of no-cost drop off locations across California. Find a recycler, collection site or event near you on ByeByeMattress.com.